RoadPro® Family of Brands is distinctly designed to bring the comforts of home to the road. With truck and auto supplies, travel gear, and mobile electronics, our brands offer on-the-go conveniences that keep you safe, comfortable and connected. 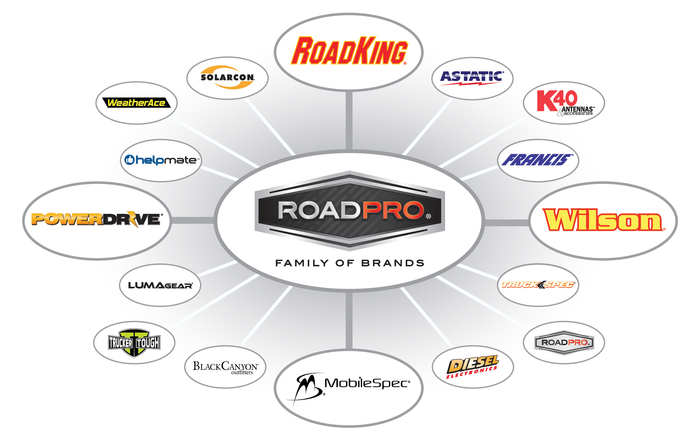 RoadPro® Family of Brands includes; RoadKing®, Wilson®, MobileSpec®, RoadPro®, PowerDrive®, K40®, Astatic®, Francis®, BlackCanyon Outfitters, LUMAgear®, TruckerTough, and more. Since 1980, the RoadPro® Family of Brands have lived with, learned from and served professional truck drivers. We appreciate, respect and admire the hard work of these men and women. When they can’t be home with family, it’s our mission to bring them the comforts of home to the road. RoadPro Rewards™ is a trademark of RoadPro Family of Brands. © 2019 RoadPro Brands, a division of DAS Companies, Inc. All rights reserved. *Open to legal residents of the 50 United States, D.C. and Puerto Rico, 18 years or older. Void where prohibited. Program begins at 12:00:00AM ET on 3/18/17 and will remain in effect until terminated by Sponsor as determined in Sponsor’s sole discretion. For complete Terms & Conditions, and to participate without using your cell phone visit www.RoadProRewards.com. Msg & Data Rates May Apply. By texting ROADPRO to 811811 and upon submitting your receipt image, you consent to receive up to 10 promotional text messages (pertaining to this program only) via an automatic telephone dialing system to the number you provided from Snipp Interactive on behalf of DAS Companies, Inc. Your consent to the above is not required to make a purchase. Sponsor: DAS Companies, Inc., Corporate Office, 724 Lawn Road, Palmyra, PA 17078.